Cette location nouvellement inscrite, la Quiet Side Farm, est une ferme rénovée du Maine (vers 1886) située sur un terrain de 9,5 acres avec vue sur Western Mountain et 330 pieds de façade rustique non revendiquée sur le long mile Hodgdon Pond. Vous pouvez accéder à l'étang en prenant le beau sentier à travers nos bois. Hodgdon Road / Long Pond Fire Road est à moins d'un quart de mille et offre un accès à l'étang Hodgdon, l'accès à Long Pond, l'accès à certains sentiers de randonnée du parc national Acadia ainsi qu'un bel endroit pour faire du vélo. Cette ferme offre la sérénité ainsi que la proximité de toutes les attractions de Mount Desert Island, y compris Acadia National Park. Nous réalisons que choisir une maison à louer peut être une décision difficile, et avec cette propriété étant récemment mis sur le marché locatif, il n'a aucune critique. Si cela vous aide, nous avons deux autres propriétés répertoriées que vous pouvez consulter pour voir comment nous "faisons des affaires" (# 449096 et # 599044). Nous avons acheté cette propriété en raison de son cadre paisible et de son emplacement! Bien que nous apprécions le tohu-bohu de la région de Bar Harbor, nous avons vraiment tombés amoureux de la beauté et la tranquillité de la "calme" de l'île de Mount Desert et Acadia National Park. Vous pouvez vous asseoir dans la cuisine ou sur le pont arrière et profiter du soleil qui se lève sur les montagnes ou serpenter à travers ses bois via notre sentier et atteindre le front de mer naturel rustique de Hodgdon Pond. L'autre côté de l'étang Hodgdon est protégé et appartient à l'Acadia National Park afin faune est abondante. Cerfs, castors, rats musqués, ainsi que de nombreux types d'oiseaux, y compris: pygargues à tête blanche, balbuzard pêcheur et martins-pêcheurs ont été vus. L'accès aux différents sentiers de randonnée, les montagnes et les zones de pique-nique de l'Acadia National Park ne sont pas loin. Jolie aire de pique-nique Marsh est à seulement 0. 8 miles et Seal Cove, où nous aimons pique-niquer et trouver des crabes à marée basse, est seulement 2. 5 miles. Beech Mountain de l'Acadia National Park, Lobster Pound Thurston, Bass Harbor Lighthouse, Southwest Harbor, historique Somesville et Seal Cove Auto Museum sont quelques-unes des attractions à proximité. Voulant aller à Bar Harbor, pas un problème; c'est juste 12 milles. This is a wonderful, cozy home. It has many updates and a lot of old world charm. 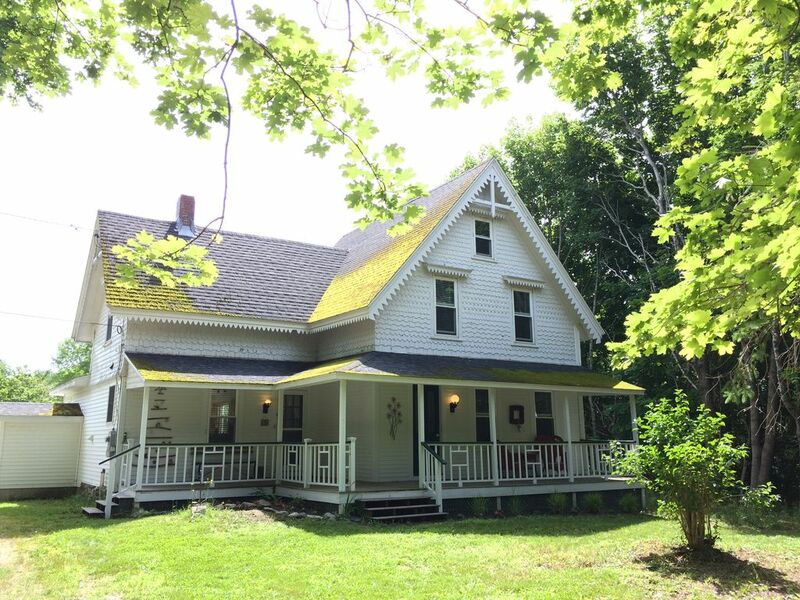 Located in a quiet part of MDI, with wildlife (deer in particular) roaming through an idyllic small apple orchard in the back of the property. Our party of 7 had ample room to spread out and each one proclaimed their bed to be very comfortable. Kitchen is large and well equipped. Washer and dryer are new as is the entire kitchen area. Large bedroom on the first floor with a queen size bed and a first floor bathroom with a shower. Three bedrooms upstairs with a full bathroom. This home has lots of charm and comfort. The back porch was our favorite place to hang out. We were entertained by the deer that came to munch on the fallen apples. At night the sky was so clear you could see the milky way and numerous falling stars. I was able to prepare some pretty nice meals in the kitchen. In the evening it was so peaceful and quiet. We played family games and went for long walks. The area is beautiful, especially in Autumn. I would love to return in the future, if possible. We are so glad you enjoyed our place, and thank you for leaving it in such good condition! You are obviously welcome to come back. If you’re thinking next summer/fall, the calendar on VRBO.com should be ready for booking at your convenience . Did you get to see Sir Quentin of Quiet Side, the big buck that graces our back yard? He so enjoys the apples! This was a lovely space for our two families to stay. Impeccably clean with all the comforts of home and near to all the Acadia attractions. Lots of thoughtful touches around the house. Definitely recommend! Thank you for taking the time to leave a review! We’re so glad that you enjoyed the house and the area! Hopefully, you’ll visit again. What a wonderful treat to stay in this clean and comfortable home. We enjoyed hiking to the pond and seeing lots of deer in the yard. The Quiet Side has so many great hikes and harbor towns to explore. The home was well stocked and the owners were attentive and easy to communicate with. We would love to stay again! Thank you for taking the time to leave a review! We’re so glad to hear that you enjoyed your stay and we hope you visit again soon! We had a wonderful experience here. The location is on the quiet side of the island but still an easy distance from towns, trails, picnic areas, etc. The house was well-equipped with everything we needed, the beds were comfortable, and the owners were very responsive. And our daughter loved the toys and the huge yard! Thank you so much for taking the time to write a review, and we are very glad you enjoyed our place and your vacation. Thanks for pointing out that even though it’s on the Quiet Side of the island, it’s still convenient to all it has to offer. Great vacation stay at the Quiet Farm !! The house was clean. The rooms are comfortable,the kitchen well equipped,including a huge lobster pot and numerous spices and condiments. This kid - friendly home has a big yard and a chest full of toys.There is a farm stand nearby,sea food stands,grocery stores.The owners replied rather quickly to our questions. This is really a great vacation property !! We had a wonderful stay at the Quiet Side Farm! There was plenty of room for 6 adults. The renovations on this farmhouse are so nice. The kitchen area is great with lots of windows. We really enjoyed the private setting whether sitting out back on the deck at night or having our morning coffee on the front porch. The location if great, close enough to be able to explore DMI and we always enjoyed coming back at the end of the day to the quiet, private farmhouse. We also enjoyed walking in the woods to the pond. Bob and Deb left really great information about things to do, restaurants and some great maps. Loved the blueberry jam! We hiked, biked and kayaked in the week we were there. We really hope to stay at this lovely house again! We are so glad you all enjoyed your stay at our place and thank you for taking the time to leave us a review!